I have finally had enough. Word 2011 might be highly customizable (compared to Pages ’09, for example), but there are still behaviours that are completely non-sensical and cannot be altered. One of my pet peeves is the non-standard use of the command-G shortcut. 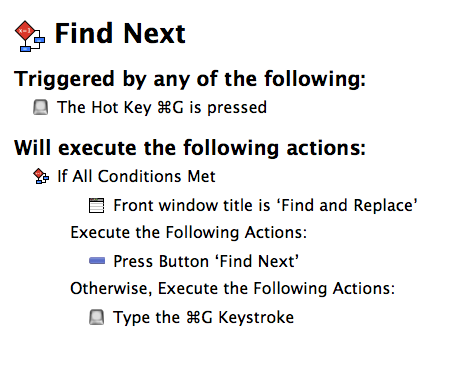 In most OS X applications, it means “Find Next”. In MS Word, it does not. I’ve written about this before. You can customize the value of the shortcut in the regular Word 2011 interface, but you cannot customize what happens when the “Find and Replace” dialog box is open and in the foreground. In such a situation, even if you’ve changed the meaning of the shortcut via Word’s keyboard customization features, command-G still takes you to the “Go To” tab instead of being the equivalent of clicking on the “Find Next” button. While you can use the Return key as an equivalent for clicking on the button, since it’s the default button (in blue) in the dialog box, command-G is such a common shortcut that it is now part of my “muscle memory” and I cannot help but use it to find the next occurrence. Fortunately, once again a third-party tool, namely Keyboard Maestro, can come to the rescue. Keyboard Maestro has the nifty ability not only to mimic user interactions with the interface in its macros, but also to use control flow commands to test the current state of the user interface and branch out to different actions depending on that state. This means that we can create a macro that tests to see if the “Find and Replace” dialog is in the foreground in Word. If it is, the macro can mimic a click on the “Find Next” button. If it is not, the macro can simply pass the command-G shortcut back to Word 2011 and trigger the behaviour normally associated with command-G shortcut (assuming you used Word 2011‘s keyboard customization features to change the default meaning of command-G to “Find Next”). And it works! No more accidental switching to the “Go To” tab! This entry was posted by Pierre Igot on Monday, November 18th, 2013 at 4:50 pm	and is filed under Microsoft. You can follow any responses to this entry through the RSS 2.0 feed. Responses are currently closed, but you can trackback from your own site.